Single edge razor blades , size 12 , .012 industrial strength thick, 100 Razors per box. 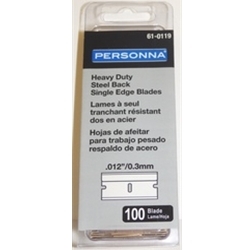 New steel backed heavy duty blade by ASR American Safety and Razor Personna brand. Each blade has a cardboard wrap for safety and come in a clam shell . We also carry this hardware hand tools in .009, 9 standard strength.